Lasting for over 50 years, PharmaVision pioneered once again and added a new item to the list of its achievements. 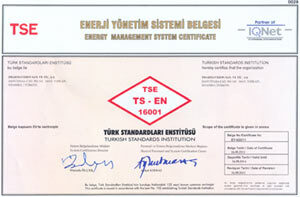 Upon successful result of the Turkish Standards Institute's audit PharmaVision became the first company to obtain the TS EN 16001 Energy Management System Certificate in the Turkish Pharmaceutical Sector. Known as the sector’s preferred business partner, PharmaVision is well aware that sustainability of energy-effective pharmaceutical manufacturing is only possible through efficient utilization of natural resources. Based on the principles of “People First” and “Respect for the Environment”, in order to leave behind a healthy environment for future generations, PharmaVision gives great importance to energy efficiency and environmental investments and prefers renewable energy sources in its manufacturing activities. Within the framework of its management approach targeting sustainable development, top priority is given to respect for the environment, natural resources and the needs of future generations in all operations performed. Moreover, energy is efficiently used in all processes. Energy efficiency is closely monitored in order to enable energy saving, environmental protection as well as occupational health and safety. These aspects are always taken into consideration in all investment, procurement, manufacturing and manufacturing support activities. In line with the “Less energy, more product” motto, PharmaVision has always aimed to maintain a balance by reducing the carbon footprint while increasing sustainable energy utilization in manufacturing and contributing to the increase of the environmental consciousness. To serve this purpose, under the coordination of the Energy Management System working group, PharmaVision have endeavoured to raise the awareness on energy saving through various training sessions. As a result of all efforts, by obtaining the TS EN 16001 Energy Management System Certificate in July 2011, PharmaVision is rightly proud of having pioneered in this subject within the Turkish Pharmaceuticals Sector.